Designed for plug and record operation with fully self-configuring digital operation, the AVX Camera-Mountable Lavalier Digital Wireless Set from Sennheiser is well suited for film and video production, as well as electronic news gathering (ENG) and A/V rental houses. The system consists of the EKP receiver, SK bodypack transmitter, and an ME2 lavalier microphone. The AVX system provides a variety of automatic functionality aimed at flexibility and speed including auto-dynamic range settings, which automatically adjusts the audio level to a recording device’s input sensitivity, reducing distortion and eliminating the need to adjust your mic’s level. The system also offers link protection, a feature that quickly scans available frequencies and will automatically switch before any interference becomes audible. 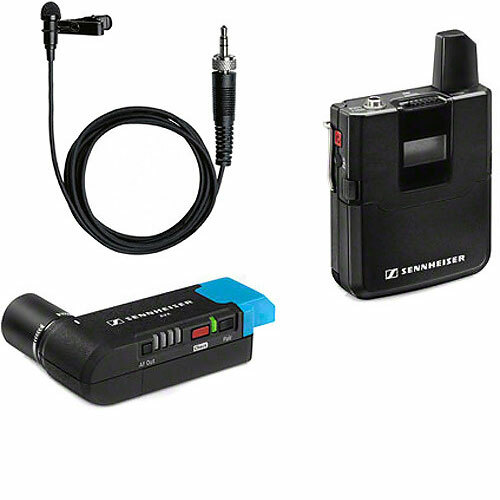 Sennheiser AVX Camera-Mountable Lavalier Digital Wireless Set ME2 is available for rent or hire from RENTaCAM Sydney.